My favorite dairy product is Cheese!! My kids are milk fiends. Particularly Jasper, who gave up nursing cold turkey at 17 months so he could drink more whole milk. Seriously, the kid is like a milk lush. For a long time, I didn't think he actually consumed solid foods; he just subsisted on milk. His pediatrician said it wasn't causing him any problems, so I gave up trying to wean him off the white stuff. I didn't grow up drinking much milk, myself. I'm not sure if it's my Asian heritage or because I just didn't like the taste, but milk was pretty much something I used to moisten my cereal in the morning. In retrospect, it might be because the only kind we ever had in the house was skim milk. And the dreaded powdered milk… ick. Anyway, during both of my pregnancies, I started becoming obsessed with organic milk and yogurt. I couldn't get enough. My favorite was this brand with a red label and a black and white cow jumping over the Earth: Horizon Organic. I'm back to normal levels of milk and yogurt consumption these days but my kids keep a run on the Horizon Organic milk. They are especially fond of the shelf-stable (no refrigeration needed, perfect for lunchboxes) lowfat chocolate organic milk boxes. Those things were a lifesaver on our cross-country road trip last summer! 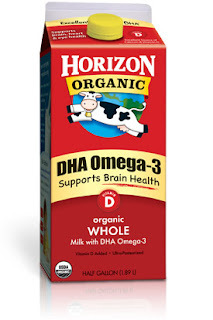 A nice addition to their product roster is Horizon Organic Milk plus DHA Omega-3, available in whole, reduced fat and fat-free varieties as well as in the lowfat chocolate milk. DHA Omega-3 is a fatty acid that is widely thought to be beneficial for proper brain and eye function for infants and children, healthy heart function for both children and adults and brain function for adults. Sounds good to me. 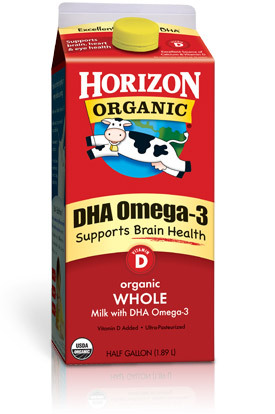 To enter and win coupons to try Horizon Organic Milk plus DHA Omega-3 (3 coupons each good for 1/2 gallon), please comment on this post with your favorite dairy product or milk memory. Entries will be accepted through April 13th and I'll pick the winner using Random.org. US readers are eligible. - Subscribe via reader Leave an extra comment letting me know what you did for each additional entry. In accordance to the FTC Guidelines and WOMMA Code of Ethics, I am disclosing that I received free coupons for Horizon Organic Milk plus DHA Omega-3 to facilitate this review. I chose to pass them onto my readers since I already buy the product regularly. I "like" Superdumb Supervillain on FB, my FB name is Vicki Sh. We love the Horizon chocolate milk! My favorite dairy product is chocolate milk. I liked Horizon milk on FB- glad to share. I love this milk! Although it is a little more expensive than regular milk, but it taste so much richer and thicker! And the chocolate milk is deliciously awesome too! My fave dairy memory is a toss up between going to work with my dad who worked at a cheese factory and stopping at a general store on the way home from my aunt's house and getting giant ice cream cones with my mom. For an extra entry i'm also now following your blog. For an extra entry i'm now following you on Twitter. For an extra entry i also "liked" Superdumb Supervillian on Facebook. For an extra entry i subscribed via email to your blog. For an extra entry i'm now following Horizon Dairy on Twitter. favorite diary product would be whipped cream! I am not a big milk drinker either but during my pregnancy I found a peaches and cream organic milk that was out of this world. It definitely helped me get my calcium during that time. I found a peaches and cream organic milk that was out of this world. It definitely helped me get my calcium during that time. My favorite dairy product is ice cream! My favorite milk memory is dunking warm chocolate chip cookies in a big glass of milk! I like organic, full fat yogurt.